You are using a web browser right now. It is the program on your computer that enables you to visit this web page. Every internet user needs to know how to use a web browser, but most don’t take the trouble to learn even the basics, so we are providing a quick lesson to get you acquainted with your browser. If you have ever found yourself looking at a website but aren’t sure which website you are looking at, this lesson is for you! This is Internet Explorer, which is installed by default on Windows computers. If you don’t know which web browser you are using, or if you have never heard the term ‘web browser’ before today, there’s a good chance you are using Internet Explorer. So we’ll use Internet Explorer for this lesson. Incidentally, there are many browsers, and several versions of each one, so the illustrations may not match your own browser exactly, but all the features mentioned here will be present on the browser you are using. We will show you how to use these two features efficiently. The address in this example is http://www.microsoft.com/worldwide/. The http:// bit indicates that the page is normally stored on someone else’s computer rather than on your own computer. The www.microsoft.com/worldwide/ bit is the location of the page on the web. Every page of every website has a unique web address, and that address will always be shown in the address bar of your browser. If you visit a page after having clicked on a link, the web address will be filled in automatically. But you can also visit a web page by typing (or copying and pasting) its address into the address bar, then pressing the ‘Enter’ or ‘Return’ key. You may type the http:// bit if you want, but you don’t need to; modern web browsers will add it automatically. You will notice that in this example, the bar contains the word Google. The search bar acts as a direct link to the Google search engine. The downward–pointing arrow on the right edge of the search bar brings up a list of other search engines, which you can use in the same way. If you want to visit a web page but do not know its address, simply type something relevant into the search bar, then press the ‘Enter’ or ‘Return’ key. So if you want to find a website that deals with Tesco in Three Bridges, Crawley, you might type something like tesco three bridges into the search bar. The title of the page, which is underlined and which acts as a link to the page. Click on this link to visit the page. Under the title is a summary of the information on the page. 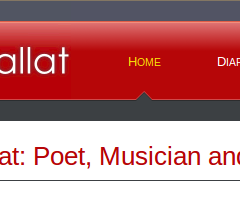 Under the summary is the actual web address of the page. You should always read the web address. If you have ever found yourself on one website when you thought you were on another, you probably didn’t check the address. In this example, you might have expected Tesco’s own website to be at number 1, but it isn’t. 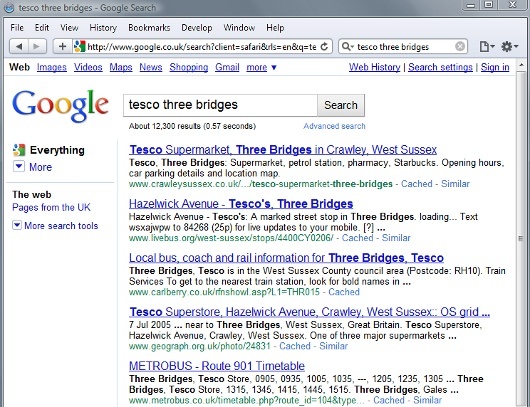 Tesco’s website hides details of its branches from the search engines. It isn’t as well constructed as the actual page at number 1 on Google, which happens to be from a Lab 99 Web Design website. For those who are comfortable with the basics, we have provided more detailed information about how to use search engines. Incidentally, the illustration above shows the Safari browser, which looks slightly different to Internet Explorer. You are now familiar with the two most important areas of a web browser. The method you use to visit a website depends on whether you know its address. If you do know its address, simply type the address into the address bar. If you don’t know its address, type something relevant into the search bar. Rather than type the address directly into the address bar, type it into the search bar instead. You will be taken to a page of search results. Select the address from the list of results. You will then be taken to the web address that you already knew. Don’t type the address into the address bar. Don’t type it into the search bar either. Instead, type Google or Yahoo into the search bar. You will be taken to a page of search results. Select the name of your preferred search engine from the list of results. You will be taken to a page on the search engine’s website. This page will contain a search box. Type the address into the search box. You will be taken to another page of search results. Select the address from the list of results. You will finally be taken to the web address that you already knew. Don’t laugh — we have seen intelligent, educated people, who have used the web for years, do this. Why are People So Bad at Using Web Browsers? The basic reason is that people generally only learn enough to do a job adequately. Once they discover a method that solves the task at hand, they stop looking, even if a small amount of extra effort would lead to a much better method. Most people, after all, have better things to do than learning how to use boring computer programs! Find out about other features of web browsers.